There's a gorilla on Mars. If it is alive, it sure didn't react to the rover going right by it (follow the tracks). By "out there", does he mean "outside me mum's basement"? It's one of the White Apes Edgar Rice Burroughs wrote about in A Princess of Mars. The St. Petersburg monkey strikes again! I'm sorry, is he some kind of Mo-Ron? I see you ... "
The Sun. Always good for a laugh. Gorillas on Mars ?! Ha ! 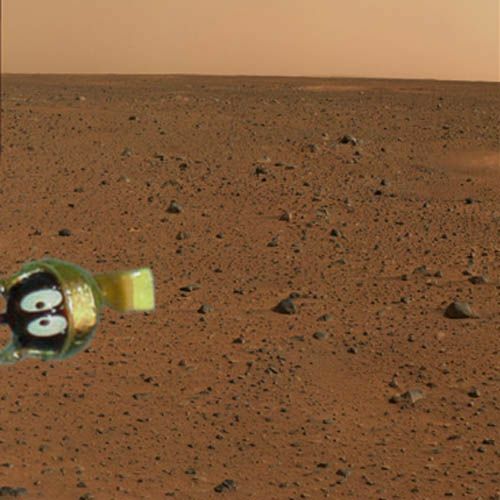 Martians are such practical jokers. John Carter seems to have gone native. How many real scientists "reckon"? Who cares about the monkey on mars: What the heck is that on uranus? Well, at least, it's not Jesus this time. I am a real scientist, and I reckon... occasionally. If a scientist reckons...that's enough for me. Mebbe we oughta 'reckon'oiter and find out for sure. I see animals on earth that are more than a mirage, this I can't (won't) be sure of..